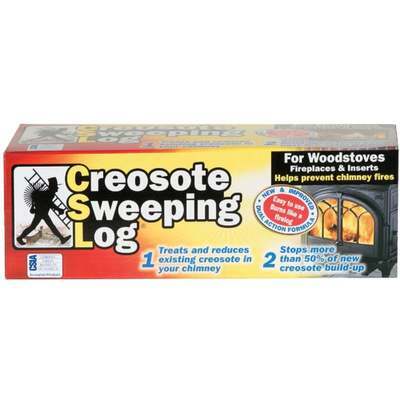 An easy, nontoxic and cost effective way to keep your chimney clean of creosote. Developed in Europe as an alternative to mechanical cleaning, it is one of the fastest, easiest, and most cost efficient ways to clean your chimney. The chimney sweeping log contains a mixture of minerals that are dispersed during burning and coat and adhere to the creosote. Over the next 14 days, the creosote becomes brittle and breaks away or is carried away in the smoke of future fires. Independent tests indicate that you can reduce up to 70\% of the creosote after a single usage. More importantly, the remaining creosote is rendered virtually nonflammable, thus greatly reducing the risk of a chimney fire. As seen on TV.